Preparing itineraries and travels plans for school groups from within Swaziland, or visiting the Kingdom, is one of our all-time favourites. Its not just that kids are so excited, full of fun and easy to please, but we are big believers in the value of travel and of exploring new places and cultures to the overall education of a child. We have a run a variety of customised school tours over the years for both primary, secondary and tertiary scholars, that have been based at a variety of venues in Swaziland. More recently our partnership with Legends Backpackers Lodge has opened up even more opportunities. Legends is a high-capacity, purpose-built youth hostel that is perfectly suited to hosting large school groups. The fact that it is situated right across the road from us, makes it an ideal base. Capacity is important, as making school tours affordable for parents is a “numbers game”, the more kids on the trip the less the individual cost. We have a variety of activities and formats that allow us to deal with large numbers of even up to 150 kids at a time. Accommodation: Use Legends Backpacker Lodge as a central base for day excursions and outings. The Ezulwini Valley is at the centre of most activities and attractions that happen in Swaziland, so its a logical place to be. The lodge itself has a swimming pool, a lawn area for games, table-tennis and plenty of seating space for meals and/or discussion sessions. Room formats include both dormitories (with group ablution facilities), as well as private rooms that are linked to private ablutions, a clear favourite with teachers. The lodge provides both self-catering facilities, as well as group catering options. Transport: if you have your own school transport, this is normally always the cheapest. If you are a foreign group, let us quote on providing group transport for you. We do have our own vehicles, as well as sub-contractors who can cope with any group size. The value of using local Swaziland-based transport is that drivers can stay at home, alleviating the cost of feeding and accommodating them every night. The group will also not be charged for any days when the vehicles are not used… when walking based itineraries are used, or when activities dictate that smaller vehicles are used for access to certain activities. Water-based activities: being a white-water rafting company, we are obviously water specialists, with a team of skilled river guides that can be used at various venues and for a wide variety formats. Our standard offering is the half and full day trips we offer on the Great Usutu River. We also offer white-water tubing, abseiling and community walks in the same area, so large groups can be easily split and rotated between activities. We also have a standby section on the Mkhondvo River, which we use for younger groups when high-water conditions dictate some caution be applied. Our fleet of rafts, plastic sit-on top canoes and tubes can also be used at flat-water venues such as Luphohlo Dam, Hawane Dam and Maguga Dam, as well as a nearby private dam venue that we have access to. Here we have programs of water safety, raft building, raft races and various team-building activities that we can offer. Our large stock of life-jackets and vigilant staff allow such activities to be undertaken safely and professionally. Cultural interaction: Well – cultural interaction starts with our staff, who are predominately local Swazis, who take great pride an explaining the intricate customs, traditions and beliefs that make the Swazi nation so identifiable as a people. In terms of activities, we have the nearby Swazi Cultural Village, the National Museum and the King Sobhuza II Memorial Park within walking distance, all of which provide discounted entry fees for organised school groups. The neighbouring Lobamba Village also provides an opportunity for interaction with local people, whilst further afield a stop at Mahlanya Market or the bustling Manzini Market are great venues for getting to grips with life in Swaziland. We are also able to facilitate visits to local schools, with the opportunity to meet and talk to local students, either informally or to discuss pre-identified topics of interest. 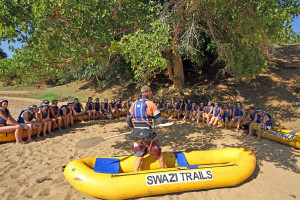 The Swazi Amazing Race: is a corporate team build activity, that we have adapted to suit older school and student groups. This half day activity is a fast and fun immersion into local culture, history, scenic sites and daily life of Swaziland. It is played out on a 500sq.km “field” using locally rented 13 or 22 seater vehicles for transport. If you have limited time in Swaziland, then this activity is one way to tackle almost everything in one go! Hot Spring soak: Not far from us is a famous local hot spring. Great for swimming throughout the year, its a nice addition of fun time for kids. The venue has a large swimming pool, space to have picnic meals and security. Being a public venue, our staff provide an extra layer of facilitation to ensure the group is well-hosted and having fun. Team-building activities: Swazi Trails are the Kingdom’s leading suppliers of various corporate team-building activities and whilst such services are often outside the budget of travelling school groups, we have scaled down versions of most of these activities that can be facilitated by junior staff, this allowing affordability. Whilst many of the games and challenges are transportable, Legends Backpacker Lodge itself is an ideal venue – with a specially prepared teambuild lawn, as well as indoor meeting and games areas. Lectures and topical discussions: We regularly arrange special presentations from local experts on a wide variety of topics that may be of interest to scholars. These can be arranged out in the field, or at the Legends Conference Room. Geography and geology: Swaziland is not flat, and it has an incredible amount of diversity packed into its relatively small land area. Highveld, middleveld and lowveld are 3 main zones, with the Lubombo Mountains often considered a forth ecological zone. Diverse land-use, agriculture and many features such as hydro power plants make for interesting discussions. The Malolotja Nature Reserve itself is a treasure trove of geological wonder, with the “oldest known human mine in the world”, the now defunct Ngwenya Iron Ore and Forbes Reef Gold Mines possible to visit, as well as natural features such as Malolotja Waterfall and the Mahulungwane Potholes. Wildlife: Swaziland has a variety of protected areas are representative most ecological zones in the country. Visits to Mlilwane Wildlife Sanctuary and Hlane Royal National Park are the best for interaction and photography of wildlife. Smaller groups can look at accessing Mkhaya Game Reserve, Swaziland’s Refuge for Endangered Species, whilst options at both Mlawula Nature Reserve, Malolotja Nature Reserve and Mantenga Nature Reserve hold potential for exploration. Adventure Caving: This is one of Swaziland’s top adventure activities… and a real itinerary ‘wow”. The trip takes approximately half a day, or an evening – with about 5 hours needed from departure to return. As an evening activity it helps to add value to tight itineraries, with the post-trip soak and pizza dinner at a hotspring, helping to tick off dinner requirements for the day too. Our venue at Kapola Estate is suitable venue for a full-day of fun activities, where open lawns, plus surrounding forests allow for all sorts of games, exploration, orienteering and fun. Cycling (MTB’ing): Swazi Trails as a fleet of bicycles for hire, which can be coupled with another fleet on our neighbouring nature reserve, allowing us to offer bicycle-based tours and experiences for small and medium-sized groups. Mlilwane Adventure: is a optional activity type day that we arrange at Mlilwane Wildlife Sanctuary whereby individuals can sign-up for a variety of different activities such as horse-riding, MTB’ing, walking, bird-watching and game-drives. A great leisure day with chances to photograph wildlife in this relaxed and beautiful sanctuary. Voluntary services: Doing good… is good! Swazi Trails are proponents of responsible and sustainable travel and we have partnered with many school groups over the years to help deliver donations, volunteer services and benefits to various local charities, schools, orphanages and social upliftment points. Remote camping: For groups travelling with their own backpacks and tents, we are able to assist with drop-off’s pick-ups and route planning for various remote hiking experiences in areas such as the Ngwempisi Gorge, Mahamba Gorge, Malolotja Nature Reserve, Mlawula Nature Reserve, the Usutu Gorge and Shewula Nature Reserve. Mobile tented camps: We currently have the capacity for setting up remote tented camps for approximately 30 persons at any venue in Swaziland. This opens up all sorts of interesting itinerary options such as including a night in a national park, sleeping out in a community village or at a scenic point. Let’s think out-of-the-box! Sports fixtures: Are you an travelling team, keen to play against a local school. Swaziland is a small place… and there are few people that we don’t know or contacts that we can’t arrange. So let’s get the fun to happen! Upcoming: Swazi Trails has a system of trails and overnight camps under development in the vast Usutu Forest, with options to hike and cycle between scenic points. We are also a partner in the Lubombo Eco Trail programme which is setting up community-based camp sites and trail networks in the country’s eastern mountains.